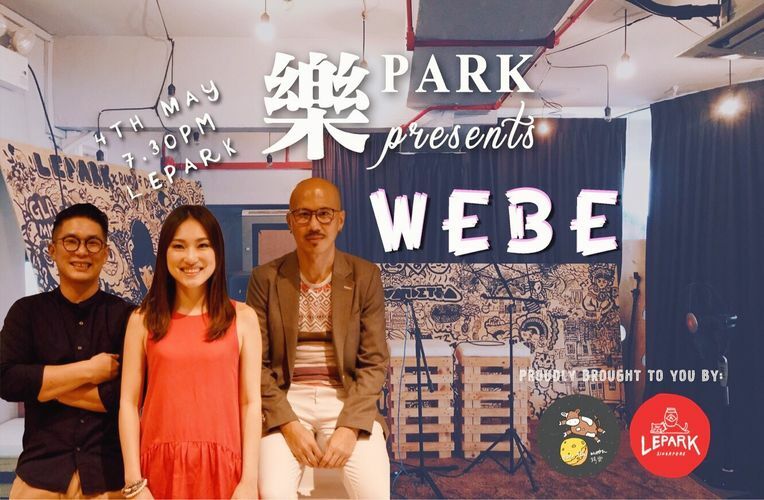 Kicking off our new monthly series, Park is Webe (Wu Eh Bo Eh), a trio bringing you a brand new, bizarre, and refreshing take on Mandarin original music. Join Dawn Wong, Felix Phang, and Kailin Yong on the rooftop of People's Park Complex this coming 4th May with a fun and open mind. Admission is free for all customers of Lepark! (Join us there for a beer and some good food). These three friends have been playing music and helping to shape the direction of Singapore music together since Kailin returned to Singapore 4 years ago. They started a six-piece band Ark Royal to perform Dawn's quirky brand of original Mandarin-jazz songs about faunas and floras, they also founded Good People Music to bring a joyfully diverse programming of music from around the world and creative ways of playing conventional instruments to school children across the island. Wu Eh Bo Eh is the trio's latest project, featuring original music that's a little bizarre, a little out of left field, but still completely relevant to our day to day living. Done in a refreshing and non-conventional instrumentation, they are sure to at least inspire some to do a double take on ordinary things and perhaps help some of us see things through slightly more colorful lenses.